I must confess that it was the Sea Venturers that first attracted me to this album. And then the delight of finding two 'desiderata' presented as well. Ever since reading Holbrooke's words in his 'Contemporary British Composers' I have longed to hear something by this Austin. " his bold and piratical deeds in theatre music." (p.253) And here is his concert overture presented in all its stormy glory. Frederic(k) Austin was born in London in the same year as Ralph Vaughan Williams. He was an accomplished singer as well as composer. It is a happy choice for the Royal Liverpool Philharmonic to choose this work as its opening selection. Austin was an organist and teacher of music in this great seaport - and across the Mersey in Birkenhead! However, he is perhaps best known for his arrangement of the Beggars Opera which was revived at the Hammersmith Lyric Theatre in 1920.
and took good or ill fortunes as it came." This mood is represented in the 'tone-painting' of this piece. We have a storm scene, visions of 'sea ships a-sailing' and more reflective music - pondering the 'illimitable ocean' perhaps. The orchestra gives a stunning rendition of this wonderfully illustrative music. Yet the emotion is well present - it does not descend into merely 'reproducing noises' Too long forgotten, one hopes that it is now firmly in their repertoire. Let us hope that they are bold enough to record the Symphony in E major. Holbrooke again :- " A Symphony I heard many years ago, and a very good symphony it was." I have always been an enthusiast for the music of the great triumvirate - Parry, Stanford and Mackenzie. And we are well served on this disk. I have, many years ago, picked out themes from the vocal score of Stanford's opera Shamus O' Brien - but I have never actually heard a note of it. Even the overture has evaded my experience. And that is sad for this opera ought to be a national treasure. It is the Irish equivalent of German's Merrie England. The overture gives a short five and a half minute sample of Stanford's wit & joviality. It uses a folk tune and a folk-like tune to weave its Irish spell. It is all about the composer exercising his native feelings in a manner which is delightful. The balance of scoring, melody and form is truly satisfying. The opera was revived in the early seventies by the John Lewis Partnership Opera Society - but perhaps the time is ripe for another revival after nearly a third of a century. It is sobering to think that Stanford wrote nine operas in all - and that none of them are currently in the repertoire. But Stanford is a composer who still needs to be re-discovered and listened to. It is not possible to truly evaluate much early-to-mid twentieth century music without coming to terms with the great Irishman as both composer and teacher. We await Jeremy Dibble's new biography with great interest. As a Scot I have a great pride in my national composers. And too little known they are. MacCunn, Wallace, Drysdale and our present master, Sir Alexander Campbell Mackenzie. However his star has been rising recently. We have excellent recordings (on Hyperion) of his Scottish Piano Concerto, his Violin Concerto and a number of tone poems. He did not write a symphony. The Prelude to Colomba Op. 28 is the first attempt by the composer in the field of 'music drama' and one of the earliest attempts by a Briton. As a man born in Edinburgh in 1847 he was eventually to become the principal of the Royal Academy of Music. Mackenzie produced a number of operas - including evocative titles like The Eve of St John based on Sir Walter Scott; The Cricket on the Hearth after Dickens and of course the present work Colomba. We must not be confused into thinking that this work is about the Irish Saint who founded Iona. It is in fact based on the doings of a Corsican family. The programme notes tells us that the libretto was devised by Prosper Mérimée - better known for Carmen! Yet with all the French colonial imagery it is Scotland which strikes me as the inspiration of this piece. I see images in my mind of the Western Hills and the Land of the Mountain and Flood! The orchestration is superb. The year 1883 is sixteen years before the Enigma Variations - yet here is piece which most certainly does not belong to the mythical 'Land Without Music'. One of Mackenzie's finest compositions is an orchestral piece called 'Benedictus.' It is an arrangement of a violin and piano piece and was composed in 1888. It is not given here, of course - but if it were it would be a fine precursor to Elgar's Enigma Variations and the sustained, if overplayed, beauties of 'Nimrod'. It is not true that English music burst alive in 1899 - composers like Mackenzie, Stanford and of course Parry were blazing the trail. And that trail is now being discovered to be inspiring and satisfying in its own right. The other two pieces on this recording do not need much comment - they are recorded in dozens of versions by a half a hundred orchestras and as many conductors. Suffice to say that it is good that the Royal Liverpool Philharmonic Orchestra choose these two masterpieces of indigenous music-making to round off this highly entertaining programme. The orchestra gives a superb account of both works - however it is difficult to surpass Barbirolli's account of the Tallis Fantasia in 1963. One final thing which makes this a wonderful purchase for me is the programme notes. Lewis Foreman is familiar to all lovers of British Music - and here he excels himself. Would that every CD came with such comprehensive and entertaining studies of the works concerned. 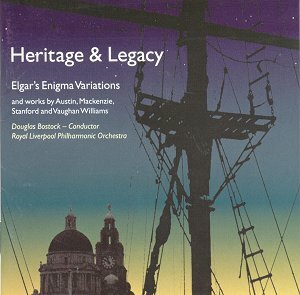 And a short excursus on Elgar in Liverpool too! Perhaps we can expect a dozen more volumes of Heritage and Legacy from the RLPO. I am sure I could make a number of suggestions for the programmes!